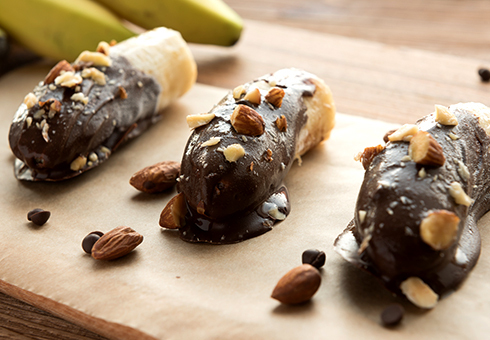 Frozen chocolate-banana pops are a simple and refreshing way to satisfy anyone with a sweet tooth. Cut bananas in half, insert popsicle sticks into them, and place them in the freezer for about 20 minutes. In the meantime, melt chocolate pieces in the microwave or double boiler. Then dip frozen bananas in the melted chocolate and roll in your topping of choice: pistachios, coconut, peanuts, crushed candy, and more. Put back in the freezer for 4 to 6 hours and serve. Delish! Variation on this theme: Make mini peanut butter sandwiches by replacing bread slices with two banana slices. Coat them with melted chocolate and freeze on a baking sheet. Yummy! Chocolate cups are so easy to make! Using a brush, paint the inside of silicone muffin cups with melted chocolate. Refrigerate for 10 minutes. Add a second coat and refrigerate for another 10 minutes. Carefully remove your cups from the mould. They're perfect for serving fruit salad and ice cream! White, dark, or milk chocolate goes perfectly with the salty taste of pretzels. Just melt chocolate in a bowl, add pretzels, mix to coat, and lay your sweet 'n' salty treats out on parchment paper until the chocolate hardens. Simply irresistible! Why not get the kids to help make chocolate medallions? Melt chocolate in the microwave or in a double boiler. Then drop chocolate by the spoonful onto parchment-lined cookie sheets. Your little helper can then sprinkle each medallion with dried fruit, peanuts, other nuts, almonds, etc. Freeze for about 15 minutes and enjoy a treat with a healthy crunch! Here's a fast and delicious way to end any Asian-themed meal on a high note. Dip fortune cookies in melted chocolate, then roll in sprinkles. It's a great way to add a fun new twist to your fortune! Planning a romantic movie night or family film fest? Spice up traditional popcorn by adding a drizzle of melted chocolate. It's a sweet 'n' salty treat that even skeptics will love! Chocolate isn't just for dessert-it's also for breakfast! Top müesli with broken up pieces of dark chocolate. Make French toast with pears and white chocolate. Melt milk chocolate into your morning oatmeal. It's perfect for getting your day off to a good start! Love chocolate spreads? Then this tip is for you! Melt your leftover chocolate, add in about 150 g of powdered almonds, then stir in a teaspoon of canola oil. It's delicious with fruit, on toast-or simply by the spoonful!